Since I woke up in a good mood despite it only being Thursday (Friday is my all-time favorite day of the week), I’m not going to spoil it by ranting about nothing I can really change. I won’t go into the whole women’s movement or whine about women’s suffrage- I’ll just talk about this (very briefly) on this person at face value (insert the joke). That’s the person that seems to be the hot topic in celebrity news as of late. I couldn’t check my email without seeing her face. It seems her recent appearances have re-ignited the seemingly gasoline-infused topics surrounding the aging of women in Hollywood- which in turn trickles down to the aging of women everywhere else. I can’t figure out for the life of me why these media outlets hype this up so much? They should be the most understanding of how important it is to look a certain way and how youthfulness equates to job offers which equates to pay. Unless Zellweger went and got herself educated like Eva Longoria– her future as an actress is dependent on her desirability as well as talent. I read somewhere that while the pay of male actors is unaffected by age, the salaries of actresses tends to top out at around the age of 34. She has her reasons to do whatever she wants to do to her body, cosmetically. For that, I wish she would’ve responded with a, “Yeah I got surgery done- so freakin’ what?” versus the lengthy response about how she started taking care of herself and used her time away from the cameras to rest and blah, blah, blah. I was hoping for a bolder response, yes I was indeed. Again I’m not wanting to prod or poke at this dreadful issue but it’d be nice to shut the critics up about it, if only for a few minutes (or months or years…). 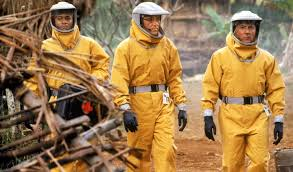 Outbreak (1995). Hopefully we won’t need to walk around like this… yet. Photo courtesy of Google images. 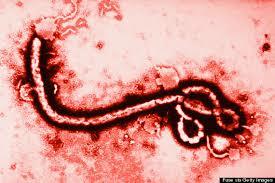 If you’ve been conscious these last few months you’ve probably heard something everyday related to the Ebola virus. Naturally, anything that poses a threat to mankind like Ebola does it’s bound to draw your attention and your imagination. I’m not here to diffuse that one bit however- the media tends to over-sensationalize certain hot topics and events and this year they get to use Ebola to stir anxiety and raise fear. Pretty much every other year the Ebola virus manages to infect a number of individuals. Should we be afraid of Ebola? Certainly. Though I think that the wiser minds interested in staying healthy would instead of obsessing over this one virus- choose to also familiarize themselves with the viruses and bacterial contagions they are more likely to come in contact with right here in the U.S.- even after this latest Ebola virus is contained… and the media sharks move on to the next hair-raising subject. As you may or may not know, I work at a hospital as a Surgical Instrument Technician. I have for the last 14 years. In that time I’ve managed to deal with not so typical cases where patients have had contagious diseases. Rarely, there have been extreme cases where patients have had to have surgery (to prolong life) and what they were infected with was so contagious that our system of cleaning and sterilization (which of course is at or better than industry standards) would still put future users at risk so the staff decided to throw out any instruments brought into the room- they triple bagged them for the incinerator. 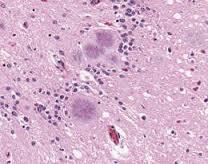 Google Prions or better yet, click here to find out about these nasty little bugs. This is the bug you’re worried about. Courtesy of Google images. As of now in regards to Ebola, I say be watchful and definitely be careful if it pertains to your specific location. In general it’s a good idea nowadays to keep plenty of hand sanitizer, wash your hands frequently and to not touch surfaces in public places- doorknobs, handrails, counters- these are all places that harbor tons of germs. Use your sleeve to open doors. Use a paper towel. Whatever will give you peace. Those habits don’t take long to develop and not only will you not get Ebola, you’ll probably not catch a cold or the flu either. This is what you should also worry about. Courtesy of Google.